← Ted: It’s a tough job but someone’s got to do it! I have a very important announcement to make. In a few months time I will be undertaking my most important role yet. I’m going to be a big brother!!!!! I am currently undergoing serious training for this new position. I have conducted lots of research and have discovered that it should be able to hear me soon. So I’m recording plenty of audio of both my singing (I know the baby will be a fan) and of course, my political manifesto. I’m running very low on decent leaders in my Army (apart from Vice-Admiral Snow and General in charge of computer stuff Ted) so I’m hoping that if I start the indoctrination before it’s born, it will come out ready to help me. At first I wasn’t terribly pleased about being a big brother but I’ve now decided that I can use it to my advantage. 1. I can blame things I break on the baby. 3. I can ask the baby to cry to drown out noises like explosives going off or me drilling into bank vaults. 4. It’s going to get lots of cool stuff that I can steal borrow. The last point is important. 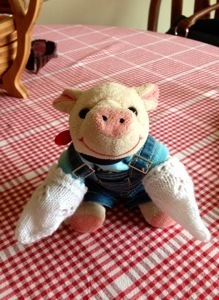 So far, the baby got some really cool mittens that Granny made for it. Now it obviously doesn’t need them for another few months so I have appropriated them. And I think they suit me very well. Oink those mittens are not for you. This is granny speaking and you know how cross I can get! And what are you doing sitting on the table! Sorry Granny, I’m just keeping them warm for the baby! Don’t forget I was here first and you still love me mostest!! !